Are you unsure whether your eating habits are on the right track? Are you suffering from fatigue, bloating, food intolerance and other chronic conditions? …your most powerful tool is good food. Understanding proper nutrition and how powerful GOOD FOOD is in creating positive, healthy habits is vital in promoting both mental and physical health. Studies continue to support the significance of proper nutrition for general health and wellness. 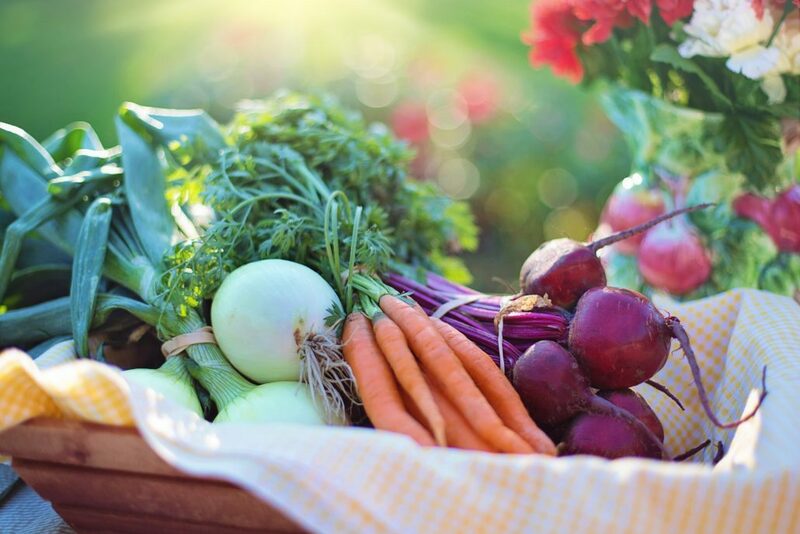 At Beyond Good Health Nutrition Therapy Programs, we serve individuals seeking sound nutritional therapy, as well as nutritional guidance for those with particular health issues. Nutrition therapy is the therapeutic use of nutrition science for the promotion of individual care, peak performance and health. 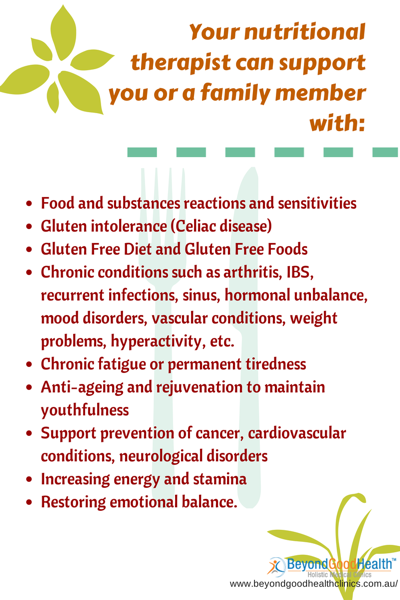 There are many reasons why people seek nutritional therapy. Some may just want to check if they are on the right track with their eating habits, while others may have more specific reasons: for example, losing weight or seeking aid with certain medical conditions. Nutritional approaches to health have been shown to promote improvement in all major body systems, from the skeletal, nervous and digestive to the reproductive and endocrine systems. Nutritional therapy can exert huge effects over the course of the disease. It supports the immune system, helps the body to endure medications/drugs, medical treatments or surgery, aids in preventing wasting and helps improve the length and quality of life. Furthermore, medical nutritional therapy includes support to achieve psychological and emotional wellbeing, healthy blood sugar balance, gastrointestinal health, optimum energy levels and tolerance to a wide array of food. A nutritional therapist knows that every person is unique and has individual requirements in terms of nutritional needs. He carefully defines a personalised nutrition plan instead of using a ‘one size fits all’ method. 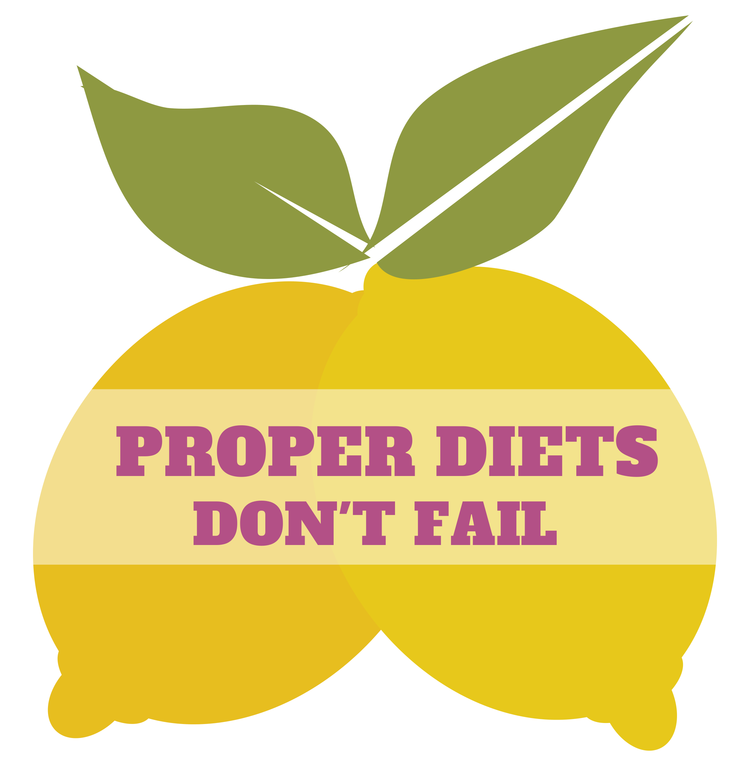 Nutritional therapy diet focuses on what you can eat rather than what you cannot. You’ll be amazed at the changes you will notice from making little adjustments and improvements to your diet, and the different conditions that nutritional therapy can improve, not only for your weight but also your mood! More than one-third (35%) of the total energy consumed was reported to be ‘discretionary food’. 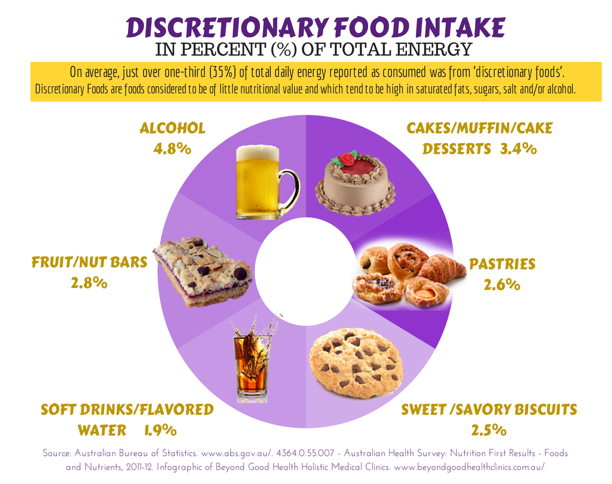 Alcoholic drinks/beverages top the list of discretionary food intake, followed by sugar-rich foods such as cakes, muffins, cookies, fruit bars and soft drinks. 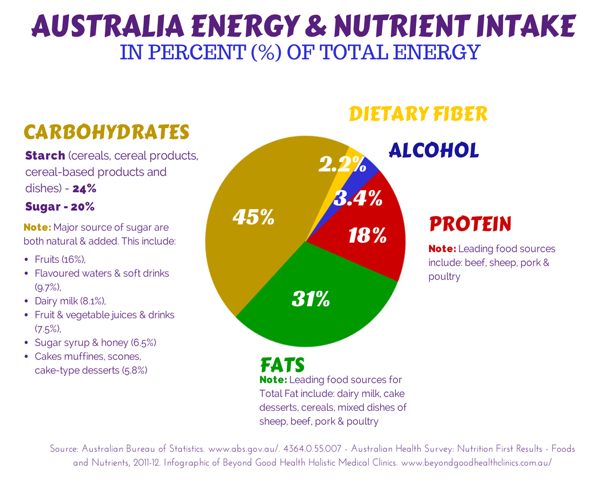 Alcohol is the fourth largest source of energy (with 3.4%), followed by dietary fibre with only 2.2%. Studies show that large consumption of sugar can lead to different metabolic problems such as insulin resistance, elevated triglycerides and cholesterol, and metabolic syndrome. Also, refined sugar is believed to be one of the primary causes of chronic diseases such as Type 2 diabetes, cancer and heart disease. Also, alcohol consumption has been associated with a number of diseases that may cause adverse effects which reduce the quality of life, or even death. These include nutrition-related conditions such as Vitamin A depletion, folate deficiency, malnutrition & pellagra; obesity/excess weight, liver disease, diabetes and mental health conditions, just to name a few. Such discrepancy between our modern diet and our bodies’ metabolic functioning has given rise to the diseases previously mentioned. In a nutshell, the modern diet is the primary reason we become sicker and fatter than ever before. What was responsible for such a change? What made us go from naturally vital and healthy people to a world of fat, sick and unhappy people? The answer: it’s the TOXINS. Our body has four primary filters – Gastrointestinal, Liver, Immune and Kidney – that work in sequence to prevent toxins from accumulating in your joints, tissues or organs, and from causing damage to the body. If one of the filters is clogged, then it will eventually cause problems in other filters, and your body’s protective system will be severely compromised. Now, toxins enter our system in four ways: from the environment, through structure problems, through stress and through the food we eat. 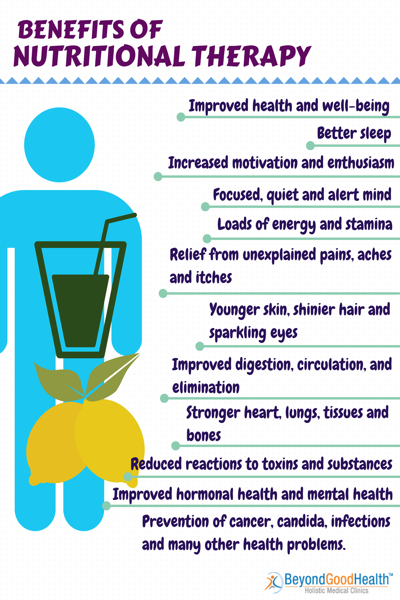 What we eat and drink plays a vital part in our health. Irradiated, sprayed and processed foods expose us to a broad array of toxins that we eat along with the food. The majority of these hormones and chemicals are used in meat production, while local produce such as vegetables and fruits are treated with chemicals before and after harvest. Furthermore, a whole assortment of food additives are used for processing foods, making them look and taste better and last longer. And when taken excessively for a long time, these foods may significantly increase the risk of having chronic diseases. Health problems, like the symptoms and diseases mentioned above, can be a result of enzyme, mineral or vitamin deficiencies, or TOXICITY. Our body nutrients are often depleted due to UNHEALTHY DIET. Nutritional therapy plays a very important role in cleansing our system from toxin accumulation and finding the proper balance of our body. Detoxification will help the body mobilize and get rid of toxins that have built up in your system over time. It gives your organs a chance to rest and heal, and thereby promotes vitality. Apart from detoxification, nutritional therapy can help you with: (Refer to the infographics on the right) Nutritional therapy is holistic in its approach – by supporting the person from an emotional, mental & physical perspective rather than only viewing them as having an ailment. 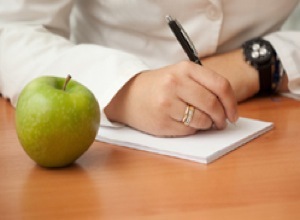 Who will Benefit from Nutrition Therapy? Nutritional therapy caters to a broad range of individuals, from kids to adults, to pregnant women, the elderly and couples. Whether you are dealing with a systemic problem, a particular chronic symptom or a general lack of energy, making changes in diet and nutrition will help you bring back your good health. Nutritional therapy works by utilizing an assessment process to determine body chemistry imbalances. It could be nutritional deficiencies or chemical imbalances that should be corrected through lifestyle changes and targeted diet. Our qualified nutritional consultants are trained and experienced in designing medical nutrition therapy tailored to each person’s particular needs. Whether you are just looking for sound nutritional guidelines, or seeking aid with a particular health issue such as irritable bowel, hyperactivity, sensitivities, prevention of cancer and cardiovascular issues, we can design a nutrition plan to help you achieve the health you desire. The kind of program will depend on your situation: Single session – Some people may only need one session with a Beyond Good Health Nutritional Consultant to put them on the right path. Specific target programs – You may need more than one session to achieve certain goals such as detoxification, or to correct existing problems such as too much or too little weight, nutrient deficiencies, gluten or dairy sensitivity, bloating or irritable bowel. Treatment support programs – One or more sessions may be called for to support other therapies. Nutritional counselling and support is an integral part of any comprehensive treatment program, as health improvement can only occur when your cells (there are around 50 trillion of them!) are healthy and well nourished.